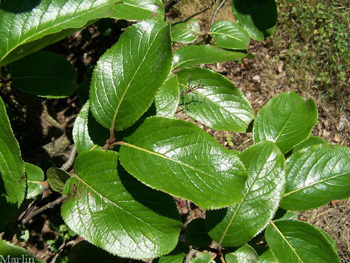 A shrub or small tree 6-30 feet high; the leaves are elliptic to ovate; finely toothed; mostly smooth, dull (not shiny), 1-3 inches long. Bark is irregular, transversely curved and grayish brown, or where the outer bark has scaled off, brownish-red; inner surface reddish brown. The root bark is cinnamon colored and tastes bitter. The small white flowers are in flat clusters; blooms March to May. The fruits are clusters of black berries, but bluish at first, on red stems. Sweet fruit is edible, but lacks flavor. Found in bogs, low woods; Eastern United States, but found in most North American states. More abundant in Connecticut to Florida; Texas to eastern Kansas. Amentoflavone, coumarins, scopoletine and aesculetine, arbutin, oleanolic, and ursolic acids, sterol. 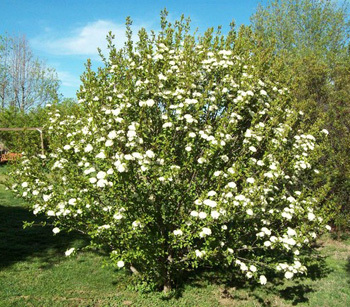 Black Haw was a favorite with the Eclectics of 19th century America. It treats all nervous complaints, including convulsions, hysteria, stress and spasms. It is one of the most reliable remedies for menstrual cramps, uterine tonic, spasms, high blood pressure, chills, fever, and pains. It is often combined with false unicorn root (Helonias) as a preferred treatment against miscarriage. It also is used to treat asthma, palpitations, heart disease and hysterical fits. It is good for painful affections, including arthritis and rheumatic complaints. It is a heart tonic, improves blood circulation. An extract of the boiled bark aids in childbirth and as a preventative of miscarriage in early pregnancy. It acts like a sedative on uterine muscles, stops menstrual cramps and afterbirth pains. Research has confirmed uterine-sedative properties. Cramp bark (Viburnum opulis), usually is used alternately with black haw. Cramp bark is weaker, containing about a third of the resins of black haw. 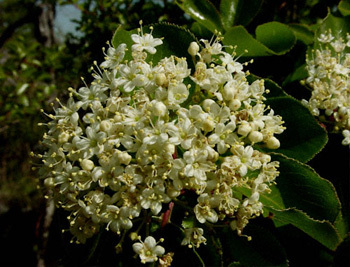 Black haw is sometimes called cramp bark (erroneously). Dig up the root in the fall and strip off the bark. Standard infusion or 3-9 gms. Berries may produce nausea and other uncomfortable symptoms.